Lee Deluxe Carbide 4 Die Set for 45 ACP. Set includes a Carbide Sizer Die, Carbide Factory Crimp Die, Powder Through Expander Die, Bullet Seater Die and all Lee products come with a 2 year warranty. No Lube is required with carbide dies. 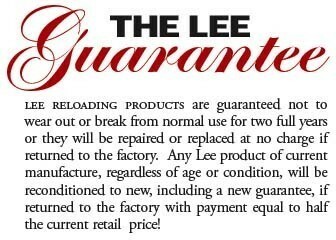 Lee reloading equipment is the best value on the market today. Lee Dies are standard 7/8 by 14 thread and fit all the modern presses such as; Dillon, Hornady, Lee, Lyman, and RCBS. We combine items for a shipping discount, please click this link to visit our Ebay store before you check out. Returns accepted if you are not satisfied. Our feedback speaks for itself. For Buyer protection, we can only accept payment thru PayPal, and can only ship to the address you provide at check out. PLEASE BE SURE YOUR SHIPPING ADDRESS IS CORRECT WHEN YOU CHECK OUT. IT CANNOT BE CHANGED LATER.